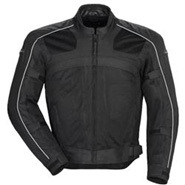 Today’s motorcyclists are spoilt for choice when it comes to choosing motorcycle jackets. No longer are motorcycle jackets limited to the classic black leather jacket that are very popular among seasoned motorcyclists such as the cruisers, etc. These days, a motorcyclist can easily find a jacket from the wide range of motorcycle jackets fit his or her style and needs. Each jacket is designed and made specifically designed for certain type of riders. Take for example, a leather cruiser jacket is best used by a cruiser rider, but will not be suitable for a commuter rider. Choosing the right motorcycle apparel has to do with the type of fabric used, the fit and the style. There are many types of motorcycle available and we need to choose which style and type to best suit us and our riding style. There are four main types of motorcycle riding jackets and they are the cruiser, racing, sport or street, and dual sport jackets. Each type of riding jackets are designed to meet the specific needs of each style of riding. The jackets are mostly made from leather and textile material, allowing the riders the choice to choose the preferred material to best suit their riding style. Besides the four main types of riding jackets, there are also other jackets types such as all season motorcycle jackets to accommodate the style and needs of the riders. Cruiser jackets are usually made of leather but synthetic textiles and cotton are also growing in popularity in the constructing of cruiser jackets. Cruiser jackets have two distinctive features, i.e. fashion and comfort. These jackets are generally on the looser side to provide room for comfort. Cruiser jackets are usually not armoured. Racing jackets are designed and constructed with high abrasion resistant materials to protect against serious injuries due to the risk of high speed racing. The most common material used for the jacket is a thick cowhide due to its excellent abrasion resistance. Synthetic stretch panels are placed in key areas to aid in rider mobility. Internal armours are common to provide protection against high speed impacts and slides. Racing jackets are designed and made to have a very tight fit for more aerodynamic, etc. Sport and/or street jackets are designed as a more casual or relaxed version of the racing jacket. These jackets are commonly made with textiles, leather or a combination of both materials. The jackets usually allow room for ventilation, removable liners and are usually armoured. Dual sport jackets are designed and constructed to accommodate the variety of different riding situations. The jackets are made of highly durable water resistant textiles that are breathable. The jackets are usually armoured, with room for ventilation, and equipped with an insulated liner for all temperatures. This entry was posted in Motorcycle/Motorcycle accessory and tagged motorcycle, motorcycle accessory, motorcycle jacket on June 14, 2018 by Yami.